I saw this on the TGR site, and fell in love with it immediately. After 5 minutes it started to feel long, but that made me love it even more. Walking or sliding in the mountains has a way of bending time. Watching the clouds move, the shadows stretch, and the sun descend can be hypnotically soothing. Filmmaker Lois Patino was able to capure that feeling. I'm back at it, after an incredible hiatus in the mountains. I'm feeling rested, relaxed, and creatively recharged after going off the grid for July. But my month-long mountain mission was far from idle. I took advantage of my wide open schedule to read books, attend lectures, watch obscure films, look at art, talk with other artists, and even make some pictures. It wasn't hard. It was actually fun. It was also a reminder of the potency of creativity, experience, and vision. It’s July and for the second year in a row, we have rented out our house in Boulder for the month and relocated to our little place in Snowmass. The main goal for my time here is to rest and recharge — physically, emotionally, professionally, and creatively. More specific goals include: daily meditation, quality time with Kate and the girls, reading books (real paper books, no Kindle or iPad), taking a break from computers, screens and social media, attending lectures, family meals, long bike rides that provide me with time to think, writing in a journal (with a pen and paper) and what I’m most looking forward to — a full week studying and making work with artists Tom Sachs and Dirk Westphal at Anderson Ranch. So yes, there is some irony in writing / posting this, but I also want to have a record of these intentions, as a future reminder. When we did this for the first time last year, I was concerned that taking too much time away from work would become a problem, and I’d fall behind with marketing and spend months playing catchup. I was committed to turning down all but the most awesome commercial work. Fortunately that difficult decision never came up. But I try to remind myself that work will always be there. Opportunities to spend time improving the life you’ve built for you and your family are more rare, and it’s important to seize them. As a freelancer, this departure can be scary. It takes faith in the market, belief in yourself, good timing, and probably a bit of luck. So while I had many concerns about this shift in gears, the extended time away actually had the opposite effect — I returned to Boulder last August totally refreshed and fired up to get back to work. My time in the mountains had given me a new perspective that allowed me to recalibrate my creative intentions, and I felt more focused and confident than ever before. The uncertainty and insecurity that can cloud my judgement had melted away, and I felt like I could see where I wanted to go more clearly. Looking back on the year since, I can see the effects of that clarity — I have worked on more projects that have engaged my creative skills and interests than ever before. I’m now convinced that there is a big difference between taking a week here, a week there, versus taking a full month to achieve a set of goals and elevate your game. So I’m looking forward to continuing this as a part of my longer term plan for staying renewed, refreshed, and ready for the year ahead. A few months ago, I shot a project with Venables, Bell & Partners, for their client, Phillips 66. The P66 brand family, which includes 76 and Conoco, was updating the designs of their service stations, and wanted to update their imagery. We selected four service stations that had interesting visual elements that would give us some variety with our compositions: Two in LA, one in St. Louis, and one in Denver. On each shoot day we’d close down the pumps, bring in a range of prop cars and talent that were brand appropriate, and arrange them into compositions. To visually differentiate the brands, we used constant lighting for Phillips 66 and Conoco, and strobe lighting for 76. Each has its unique advantages, and I’m equally comfortable with either, but the workflow for each is very different. Which makes the images different. Of course there were obstacles to overcome: Including the client’s signage / branding in every shot in some way. Scheduling the shot list to work both with the sun and the shade. Controlling car traffic. Controlling foot traffic. Removing snow (we were shooting in December) to make it look like Summer. Removing power lines and cars and oil spots and Taco Bells to make everything look better. But the main challenge with this shoot was coming up with many different and interesting ways to photograph gas stations, when really they’re all basically the same. In the end, we delivered a comprehensive library of images for all four brands. Some images are straightforward, and others have been worked on extensively, with many elements rearranged, removed and rebuilt. Huge thanks to the team at Danklife, who brought loads of expertise and vision to this project. That said, here are a few of my favorite images. See more of the project here. It’s award season in the photo world, when we photographers round up our best work and pay a bunch of money to enter those images into an ever expanding range of photo contests. Over the years I've had mixed feelings about these contests. It’s impossible to say if winning alone actually does anything for a career. I believe that marketing is a long term cumulative effort, and that the results are due to the sum of the parts, not any one part. I have been entering my work in shows since around 2002, when I was just getting started as a full time pro. My reasons for doing so then were mainly because I believed that winning would be my ticket to an endless stream of creatively and financially rewarding commissions. Which is mostly not true. But each year I’d enter work, and pay the uncomfortably high fees, and feel sort of weird and icky about the whole thing. Then I read Bruce Mau’s Incomplete Manifesto For Growth. And when I got to #26, which says “Don’t enter awards competitions. Just don’t. It’s not good for you,” something clicked and I spent several years believing it. So I didn’t enter any of the big contests, because I believed that they weren’t good for me. It was an easy thing to believe, and it was even easier to not submit work or pay entry fees. It was also easy to not make new work because there were no deadlines. And for me, deadlines are fuel. Since then I have come around, and realized that the real value is not in getting published in a award books. Winning awards is more a validation that you've done something well. With this in mind, this year I drove to Howelsen Hill in Steamboat Springs to shoot ski jumping. My goal was to come away with one image that I could enter (with confidence) in the Communication Arts Photo Annual. Jumping is something that I have always wanted to shoot, and seemed like a good chance to try something new and maybe learn a thing or two. 1. Shooting ski jumping is very technically challenging — especially with strobes. 2. The real value in photo contests hasn't been in the winning — it's in the making. The awards are a byproduct of that achievement. One of my former interns, Jordan Felix, contacted me recently. He’d just moved to Miami to pursue a job with a private museum. He was also doing some writing on the side for Juxtapoz, and asked if he could share some of my Freemasonry images on their blog. I said sure, answered a few questions, and sent him an edit to use. The story appeared on the Juxtapoz site a few weeks later. A week or so after that, I was contacted by UK design blog It’s Nice That, who wanted to do a feature as well. I answered a few more questions, and sent off another edit. Then the project was featured on Fast Company’s design site, Co.Design. Then, on to The Week. To its most recent appearance on The Huffington Post. Fortunately, this particular project has a timeless quality to it. So while some of these images were made almost 10 years ago, they are still relevant, as Masonic culture is in a sort of a glacially slow downward slide. Not much has changed. 1. The speed and ease with which images and thoughts can spread online. No other medium can travel as far and wide, and do so without consuming resources like paper, postage, and fuel. 2. You never know when little things will lead to much bigger things. In this case, one email that contained a few pictures and some words went on to travel the world and reach a wide, international audience. Similarly, I'm reminded of the first picture I shot for this project, and how I almost dismissed the moment and moved on. It's an image of the light in an old stairwell, and it's the image that kept me coming back for many years, searching for that elusive, beautiful light. It’s a good reminder to take an extra minute to pay attention to the little stuff, and treat it with importance. 06. Minolta XG-M // my first camera, passed down from my mom. 09. Jamie Kripke, Shot in the Back, 1995 // the first picture I ever sold, for $75. 15. Stephen Shore, U.S. 10, Post Falls, Idaho, 1974 // In depth analysis at JK Journal. 38. Paul Graham, The Present, 2009-2011 // Currently on view at Pier 24 in San Francisco. And, here is a video of the entire talk. Apologies for the poor audio, the video crew had some technical difficulties that day. It’s no surprise (and sort of sad) that the last post here in my journal is from early January when I was in Austin. The road has been a bit rocky for me since. So in the interest of filling this time gap, and maintaining my creative journal, here is an update from the last 8 months. Hopefully this both explains my lack of writing, and also provides a mile marker for me to look back on someday. Leading up to Cyclocross Nationals in Austin, I’d been dealing with a nagging pain that started in my shoulder, and radiated down to my tingling fingers. I wasn’t entirely sure what caused it. Possibly too much time sleeping on my stomach, soft beds, bad posture, general stress about nothing in particular, or sitting in the basement pedaling away on my trainer in preparation for my big race on January 9th. The frequent pain had been keeping me from sleeping in the weeks leading up to the race, and I was feeling pretty drained on race day. By the second lap, I knew that it wasn’t going to be a good day. By the third lap, I was taking beer handups and making the most of my lackluster performance. I finished 53rd out of 120 in the Mens’ 40-44 group. Once I returned from Austin, the pain got much worse, often coming on in waves at night, sometimes making me wince and clench my jaw, looking for a sleeping position that would make it go away. I didn’t know what was happening, but my sleep sharply decreased, while my frustration and anxiety increased. After a month, I was having trouble staying focused on work, hanging out with Kate and the girls, or doing anything that was normally enjoyable. Over the next 2-3 months, I started a long, expensive, circuitous journey in search of a treatment. I saw Physical Therapists, Chiropractors, Massage Therapists, and Acupuncturists that all seemed to either have no effect, or make it worse. Finally I paid $600 for an MRI, which revealed a severely inflamed C6 and C7. The joints around these vertebrae had closed down, pinching off the nerves that travel down my arm to my hand. Best case treatments include PT or steroidal anti-inflammatory drugs, while worst cases require surgery and/or cervical fusion. I was 43 and until then had been fortunate to stay healthy and physically able. But the news of the MRI and my crappy C6/C7 sent me into a downward spiral. Of course I was going to live, and it could certainly be worse. But there was an element of having to consider my mortality and the inevitable physical decline that precedes it. I have always felt young, and this was my first true taste of what it’s like to feel old. It was a difficult thing to ignore, because the pain was my constant reminder. It was May, and I hadn’t been on a bike since my race on 1/9, as I was physically unable to ride. It didn’t take long for me to realize that cycling is a huge part of my life — one that keeps me focused, balanced, and positive. After four months off my bike, I was very unhappy and pretty depressed. I eventually found my way to Nancy Harrison at Functional PT, who was able to see the bigger anatomical picture, and make some forward progress with me. Over the next 6 weeks, she and her staff got my problem treated. They helped my knees feel a lot better too, another issue that no one else has been able to understand. While working with Functional PT got me much closer to being better, I still wasn’t there. I was cleared to get back on my bike in late May, and I showed up at a friend’s birthday party where we’d go for a fun ride followed by pizza, beers, and a piñata. The ride was both the best and worst ride I’ve ever been on — my lungs burned and my legs felt like cement, but I was so happy to be riding it cancelled out the bad stuff. Unfortunately, by the end of the ride I was back in a lot of pain, and started to worry about never being able to ride again. I remember standing there, my arm throbbing, watching Evan obliterate his birthday piñata, imagining myself either never riding again, or having to get cervical fusion surgery. I decided it was time to try something more, and started a 5 day course of oral Prednisone, a powerful steroidal anti-inflammatory. I had been carrying a prescription around for several weeks, and was hoping to avoid taking it, as there are some negative side effects, and I have never liked taking drugs. Within literally minutes I felt better, and a wave of relief washed over my body. But the following week was strange. I lost a job to another photographer on which I had [foolishly] pinned too many hopes, and it made me so angry I felt like I wanted to smash something. I have never (ever) been one to smash things, and I had this anger simmering inside me which I couldn’t explain. I felt like a victim, and that nothing was going my way. It had been six months since Austin, and I felt like I didn’t have anywhere to put all the anger and frustration that had been accumulating in my body. I did and said some things during those dark months that I regret. It turns out that rage (aka “roid rage”) is a known side effect of Prednisone, but I never imagined that it would affect me. The difficult part is that those words and actions were the direct source of how I felt. And those feelings were really there, but I wasn’t thinking or feeling clearly. I realized that it was time to stop everything I was doing and hit the reset button. July would be the month for me to start over. We rented out our house in Boulder for the month (thank you AirBnb) and relocated to my family’s place in Snowmass. It would be a time for me to renew physically, creatively, emotionally, and spiritually. Thanks to continued work with the PT, and the drugs, my body seemed to be better, so I started the month by riding with Evan from Boulder to Snowmass over two huge days. While in Snowmass, I ditched the iPad in favor of paper books. Turned my phone off and left it off as much as possible. Took a break from social media. Spent many enjoyable hours building the next body of work for Alpine Modern, and shot a bunch of personal work in and around Aspen and Snowmass. Discovered the podcast, and listened to talks on philosophy, religion, politics, and art. I slept well, and slept a lot. For the first time, I began a regular meditation practice, starting every day with 10-15 minutes of mindfulness. I spent long hours with Kate and the girls, by the pool, on a hike, or just enjoying family meals. That month has had a profound effect on my life. By the end of July, I felt great, and was spending a lot of time just appreciating my good fortune and life in general. I capped the month on my 44th birthday with some good friends that joined me for a long, hard mountain bike race from Snowmass to Aspen. Around three hours into the race, I was climbing toward the top of Aspen Highlands, when I started to think about my girls, my wife, my family and friends, my incredibly restorative month, and all the frustration that led up to it. Suddenly, I started crying. And I couldn’t stop. They were tears of joy, gratitude, pain, and frustration all mixed together, and they came pouring out all at once, until there weren’t any left. Going back to work in August was more difficult than I thought. In the process of hitting the reset button, I seem to have re-calibrated my compass, and am now thinking about taking my professional, personal, and spiritual life in a more considered direction. Coincidentally, I’ve spent the last few months preparing a talk for Caffeinated Mornings on 9/4 (RSVP here) which has been a great exercise in terms of determining that direction. My talk is based on looking back at all the images (by other artists) that have shaped my experience as a photographer, from high school newspaper shooter to full time pro. But looking back, I am realizing, is ultimately about looking forward. The first half of 2015 was pretty rough for me. But now that I’m on the other side, and am feeling great, with renewed clarity and vision for where I want to go, I’m able to see those 6 months as a gift. 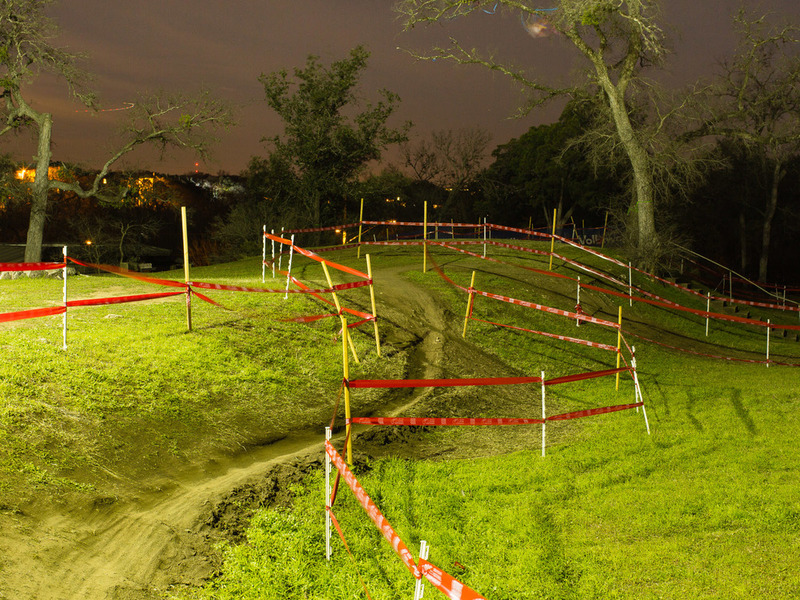 I have been in Austin the last few days to race at the Cyclocross National Championships. I brought my camera with the intention of trying to shoot cyclocross in a way that it hasn’t been shot before. The night after my preliminary non-championship race on Wednesday, and after dinner and a few beers, I returned to the course around 10pm. The sky was clear and the moon was going to be near full. It was also really cold and windy, my legs were tired from racing, and I really wanted to get off my feet and go to bed. But I started walking the course, and shortly afterwards, the moon came up and lit many of the features on the course. It was surreal to be out there alone at night, on a silent, empty course that is generally reserved for crowds, chaos, and cowbells. It took around 3 hours to walk and photograph a complete lap from start to finish between the course tape. I used a normal lens set at about the same height that your eyes are while racing to create a racers’ view. My championship race is at 2:30 today. It’s still cold, and my legs are still tired. But I’m looking forward to getting out there for a few more laps before putting my bike away until Spring. I nearly made it to Paris for work last week. Almost as exciting as the prospect of shooting in Paris on an expense account was the fact that our scheduled wrap day was the first day of Paris Photo, which was from 11/13-11/16. Paris Photo is arguably the best photo fair in the world. 169 Galleries, Art book publishers/dealers, exhibitions, lectures -- revolving around both classical and modern fine art photography -- pretty much photo nerd heaven. I attended (the 2nd annual) Paris Photo LA last spring, which takes place on the Paramount Studios backlot, and loved it. Unfortunately Paris was dropped from our list of shoot locations and replaced with Sunnyvale, CA. Boo. BUT. I found a virtual tour of Paris Photo which takes place in the insanely beautiful Grand Palais. I usually avoid these virtual tour things, but this one is actually pretty awesome. Click on the map in the top left, and anything pink is available to view. It's well worth a few minutes to wander through the fair.